As someone that has maintained a gluten-free lifestyle for over 10 years now, I have sampled my fair share of products, both for my own curiosity and for the purpose of sharing here with you guys, the best and healthiest options in the market place. 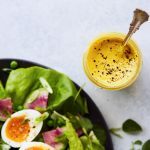 In my home, I have more than simplified my life and the meals I create, but like anyone else I both have cravings and I also believe in balance. On a recent morning I found myself really craving a bowl of cereal, a hankering that happens but once or twice a year. I realized I didn’t exactly have a go-to gluten-free cereal that I not only loved but one I could feel OK about eating. With my husband being the only regular cereal eater in our home, everything in the pantry contained gluten. I went on about my business and reached for a smoothie instead. It wasn’t long after this when Van’s approached me to try their new gluten-free whole grain cereals. I had hoped this would be a good option to have in the house on the rare occasion I was craving cereal and that maybe it would be something my husband (who has no dietary challenges) could actually enjoy, too. My hopes were answered, this cereal is great! The Cocoa Sensation was hands down our favorite! 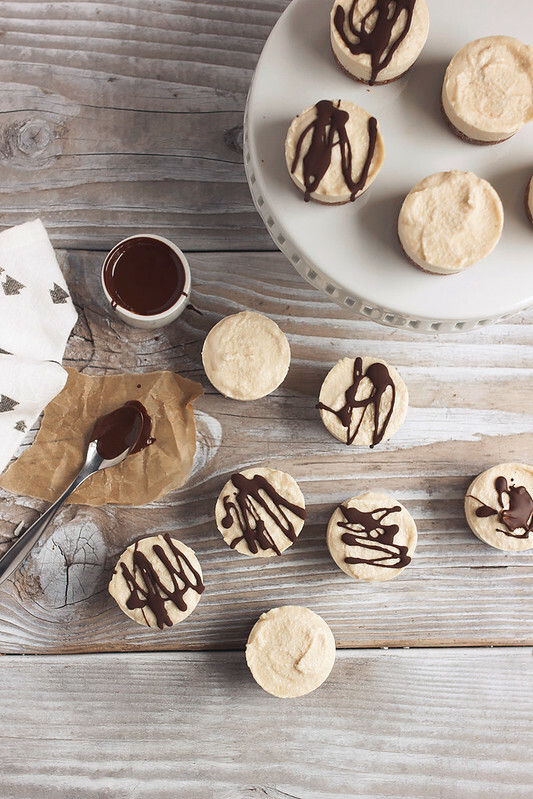 How could chocolate for breakfast ever not be amazing? After enjoying a bowl with some homemade coconut milk and feeling very confident this was something I could recommend to you guys, I also instantly began to think of a creative way I could use the cereal in a recipe. 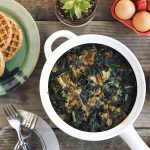 After all, being that I am not a bowl-of-cereal-every-morning kind of girl, I wanted to make sure the cereal was enjoyed and didn’t go to waste. Instantly I thought the cereal would make a perfect crust for a sweet treat, being that it’s sweet, but not overly such and loaded with the perfect amount of chocolatey crunch. 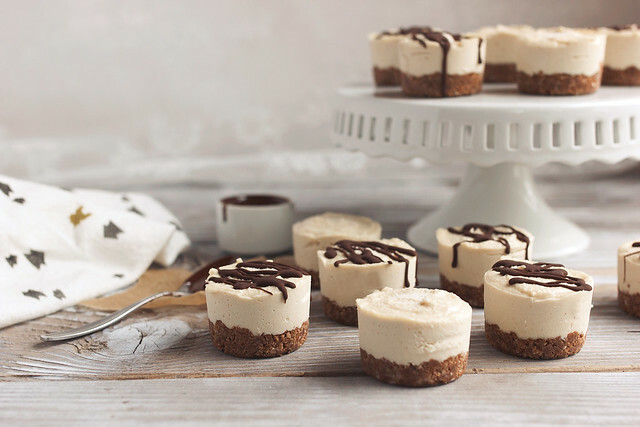 These adorable dairy-free mini cheesecakes were born. 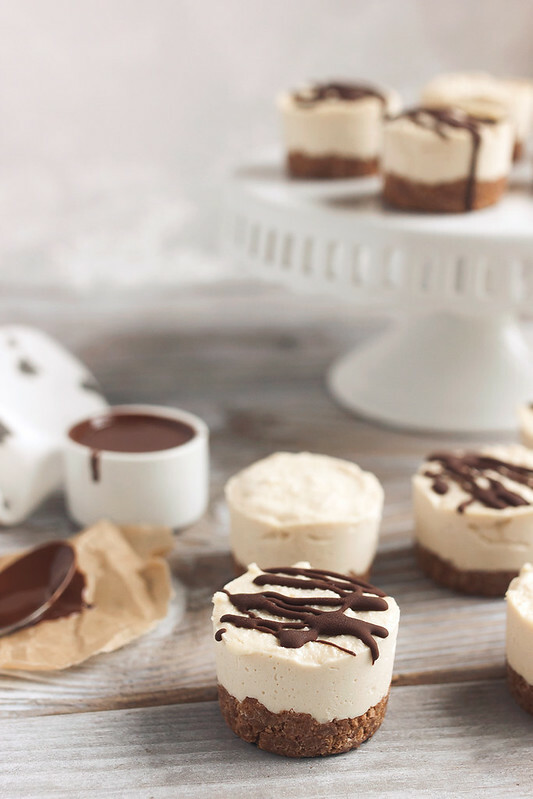 The best part, dairy-free or not, everyone loves these creamy bite-sized desserts. I have even served these to a house full of meat-eating, not-too-healthy men and they were all floored when they found out they were free of gluten and all the usual dairy. 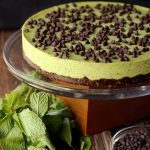 Soaked cashews provide the incredible, thick filling and a little fresh lemon juice brings the tartness, usually found in a traditional cheesecake. 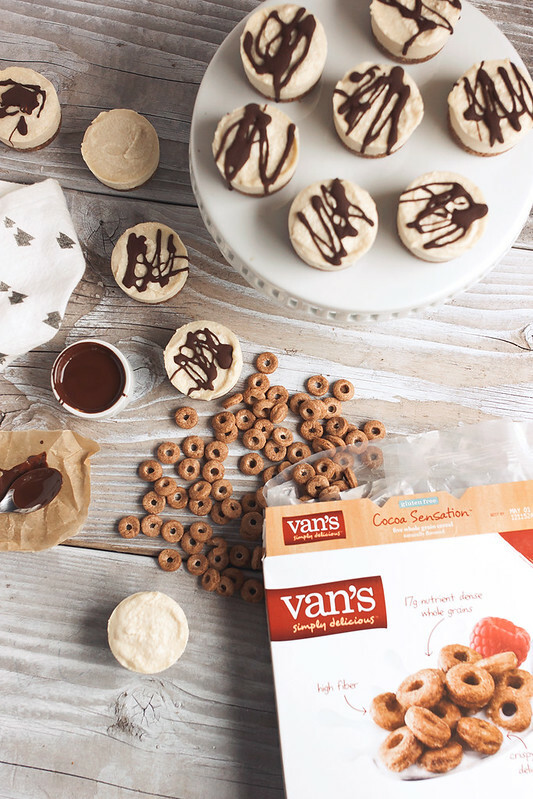 The Van’s Cocoa Sensation Cereal makes for the perfect crust, bringing just the slightest little crunch, which is so complimentary of the creamy cheesecake layer. 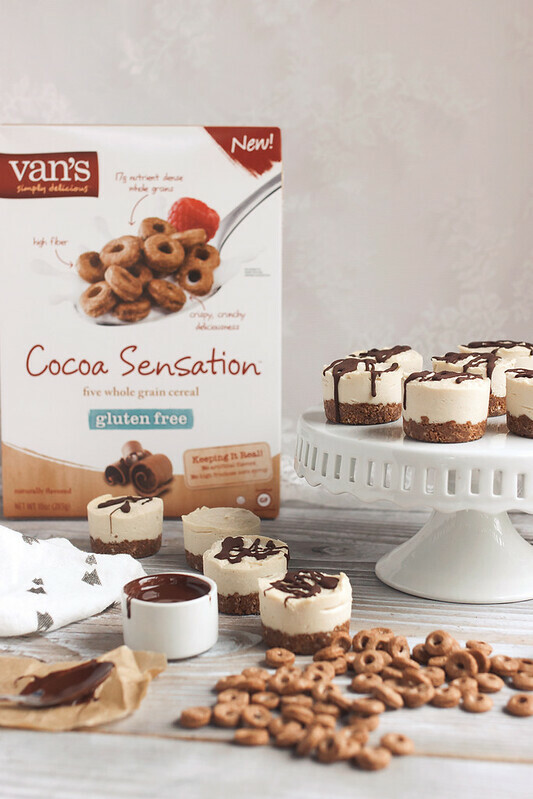 Van’s Cocoa Sensation Cereal contains 17 grams of nutrient dense whole grains, gluten-free oats, brown rice, millet, quinoa, amaranth and 6 grams of fiber per serving, contains no artificial colors or flavors, no high-fructose corn syrup, no corn, dairy or eggs. Add the Cocoa Sensation Cereal to the food processor and pulse a few times until it’s turns into meal, crumbled and broken up, but not a fine flour. A few bits are good. Pour out and set aside. Add the dates to the food processor and process until only small bits remain and it comes together into a ball. Add the cereal back to the food processor, along with the remaining ingredients. Process until it comes together into a dough. The dough should hold together when you press it in your hands. 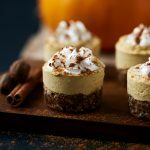 Using 12-cup non-stick muffin tin or 12 cup mini cheesecake pan (which is what I use), add a tablespoon of the crust mixture to each cup. Press down firmly with a spoon, a class or what I find works the best, is a cocktail muddler. Pack it in nice and tight. Set into the freezer to set up. Once the cashews have soaked, discard the soaking water, give them a quick rinse and add the cashews to the container of a high speed blender or food processor. Add the coconut oil, lemon juice, maple syrup (or other sweetener) and vanilla. If the mixture is too thick, add just a little water, one teaspoon at a time. It should be a very thick mixture so don’t add too much. Once blended, divide the filling evenly over each of the crusts. Give the pan a few firm taps on the counter to remove any air bubbles, cover with plastic wrap or foil. Freeze overnight, or until solid, at least 4 hours. 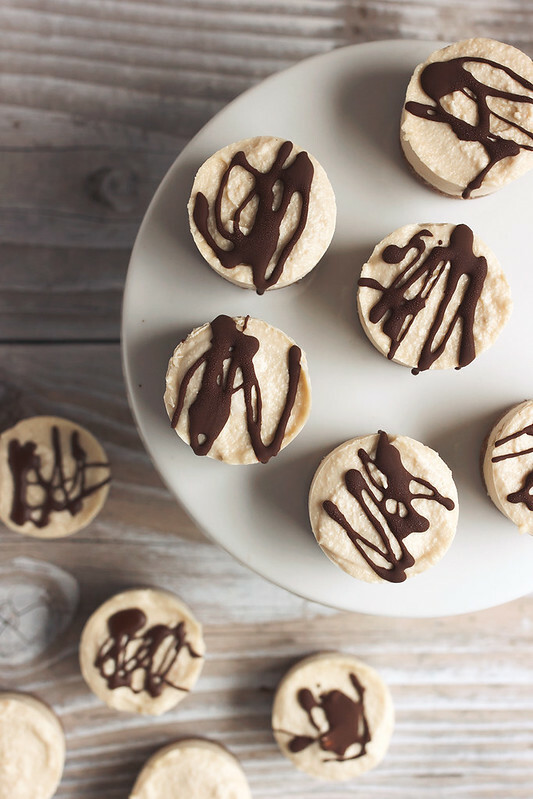 Drizzle melted chocolate over each one, if using. Serve or allow to soften up even further. I like them to be somewhat soft, so I let them thaw for about 20-30 minutes. This is a sponsored conversation written by me on behalf of Van’s. All content, ideas and words are my own. Thanks for supporting the sponsors that allow me to create new and special content like this for Tasty Yummies. I love (LOOOOVE) that you used cereal as the crust! We rarely have cereal in the house because I have a tendency to go through an entire box within two days (heh), but I can totally get behind reserving half a box for cheesecake crust. High fives, woman. Thanks so much, girl!! Cereal for dessert, it’s never a bad thing! Cereal high-fives right back atcha. THE RECIPE I’VE BEEN WAITING FOR!!! 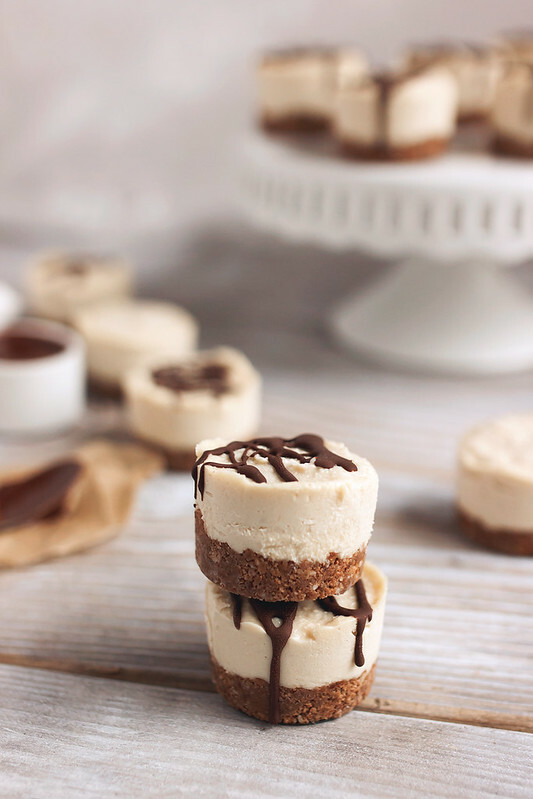 On my list as “MAKING THESE tomorrow! !” Oh, YUM!!! 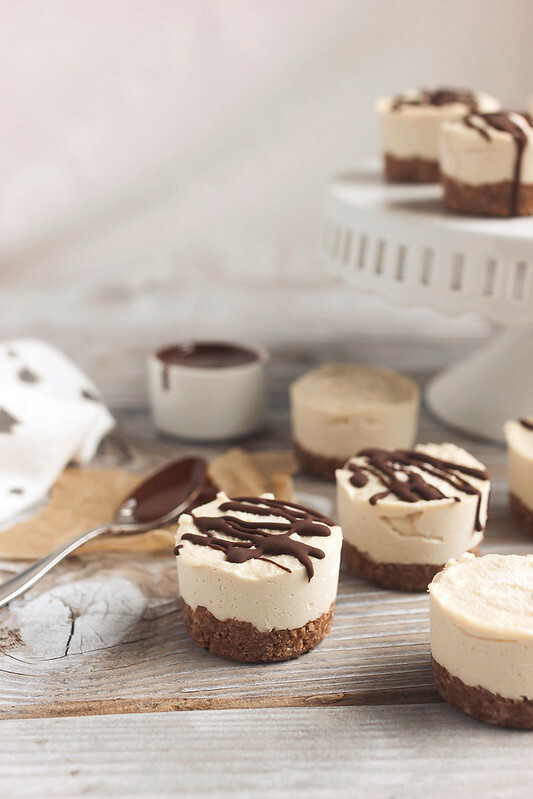 Love everything about these little cheesecakes!! They look amazing! Can you taste the cashews? Hi, every year in May I do a Tea for 128 ladies at our Church how many days in advance can these be made? I would say 2 to 3 days, max unless you are planning to freeze them. Which is probably what I would recommend. Freeze and then pull them out ahead of time. I would also recommend you do a trial run ahead of time to see how they do being made a few days ahead or frozen, give the amount you have to make. Hope that helps.